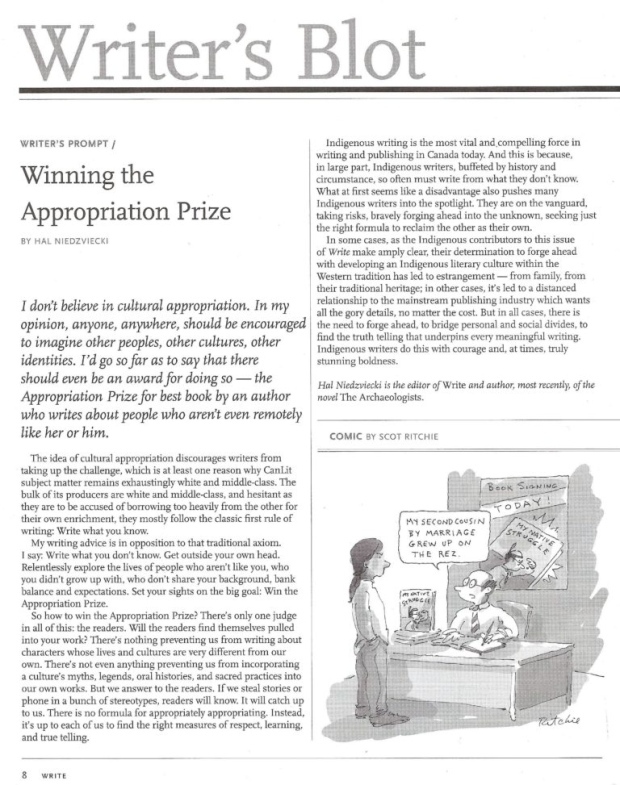 In May 2017 Hal Niedzviecki wrote a short piece titled “Winning the appropriation prize” in Write magazine from the Writers’ Union of Canada (see Appendix 1) that reignited a conversation in Canada and elsewhere about cultural appropriation, colonialism, racism, and the politics of exchange. This was coupled with some journalists offering to contribute funds to support the fictional prize, as well as resignations, outrage, critique, and more (see Appendix 2). While not explicitly attending to questions of geography, we trust that this debate is important to radical geographers who are interested in unsettling how we know what we think we know about race. Here poet, novelist, and essayist NourbeSe Philip weighs in. Hal Niedzviecki has every right to express his opinion, as badly argued and uninformed as it is; after all, we do have protections regarding free speech short of hate speech. What I find inexcusable, however, and profoundly disrespectful is that The Writers Union of Canada (TWUC) would publish an issue of Write dedicated to Indigenous writers – long overdue, I might add – and have the editorial introducing the work be a flippant and uninformed piece about appropriation. I enter this debate for two reasons: some 25 years ago this very same issue erupted in Toronto and resulted in the then Women’s Press splitting. The cross-country debate back then was equally fierce. My response to that was “The disappearing debate, or, How the discussion of racism has been taken over by the censorship issue” (in Frontiers: Selected Essays and Writings on Racism and Culture, Mercury Press, 1992; and Blank: Essays and Interviews, BookThug, 2017), a title that speaks for itself. It’s troubling to witness the return of these issues with apparently no greater understanding, truth and reconciliation notwithstanding. As a presently a paid-up member of TWUC I feel implicated, albeit unwittingly, in this issue and it is as such I enter this debate. I want to draw readers’ attention away from the issue of appropriation for a brief moment and ask them to focus on a smaller, less controversial issue – that of hospitality and protocols around how you welcome and treat a guest. It has many reverberations in the history of colonialism. All cultures, traditional and modern, including Western cultures, have protocols about the guest and how the guest should be treated. Indeed, in early Christian times, Christians were expected to keep a bed, some bread and a candle for the unexpected guest. In African cultures, it was often the occasion on which a large animal would be killed, so that the guest could be fed. (Invading colonisers often used that practice to further exploit the people.) In the history of the many, many cultures colonised by the European you will find numerous instances in which the guest, the European, was taken in and treated well – even taught how to live on the land. As we know so well now, that generosity was often repaid by conquest. My point being a very simple one – when a guest comes to your home, especially an invited guest, you honour them, you provide them the best. More to the point, you do not invite someone to your home or living space and then insult or disrespect them. What TWUC did was the equivalent of this and I suspect that had those writers known what the editorial was going to be about, none of them would have submitted their work. What kind of culture, literary or otherwise, produces this kind of uncivilised behaviour? A culture whose very integuments are woven around a kind of everyday racism against peoples of colour. TWUC, one of the gatekeepers of literature and culture in Canada, invited these writers to submit their work and then published an editorial that entirely disrespected the sea-change that the publication of these writers represent. Why didn’t TWUC invite an Indigenous guest editor, as often happens when magazines have themed issues, and of which there is a long history in the culture of literary Canadian magazines? Why did the oversight committee not catch this travesty before it was published? What has happened is tantamount to publishing an issue dedicated to women’s issues or feminism and having an editorial, written by a man, making light of, or challenging the widespread sexual abuse of women, or domestic violence against women. Can we imagine the firestorm that would have erupted over such a glaring and brutal example of sexism and misogyny? Instead, what we have is a firestorm over appropriation, which was not raised by the invited writers, with the two camps arrayed against each other. I am suggesting here that the debate about appropriation simultaneously erases and supplants the racist act that the publication of the editorial represents; further it illustrates how systemic racism functions and how we can all be baited to participate in a debate that hides even as it reveals. Yes, the issue of appropriation is a very real one – I might add here that living in the present, globalised, commodified world, there are very few of us who do not indulge or partake in practices of other cultures – from yoga to mindfulness meditation to Buddhism, to karate and other Asian martial arts. Is any of this appropriation? If not, why not? Further, Black culture – especially musical culture – has always been and continues to be appropriated by all cultures, bar none – Elvis Presley, Adele, Lilly Singh, A Tribe Called Red, the Beatles, the Rolling Stones – the list is long. There appears to be no understanding that Black music bears a name, has an address and a particular and tragic history. Indeed, to use a digital example, Black culture is approached as if it is a Creative Commons to which everyone ought to have access. And it is a zero-sum game because the widespread consumption of Black culture has not resulted in any greater respect for the original creators. Indeed, in an extractive capitalist world, the opposite has been the result. Indigenous peoples have their own arguments about how their cultures have been appropriated as, I suspect, do all colonised cultures and peoples. Appropriation is a complex issue, which often stems from a racist power structure which can do real harm to those who are racially, socially and politically marginalised. The debate over appropriation of voice, which this particular debate is all about, often lurches between those who are rightly concerned with the dangers of literary censorship on the one hand, and those who are concerned about very real damage that can be done by appropriative practices. There are those who argue that you cannot cage what is uncageable – the human imagination and inspiration, and that creativity and inspiration cannot be boxed in by identity politics. This is true, but it does not necessarily mean that one has a “right” to poach the cultures of others, particularly those whom your own culture had a hand in destroying. As I argued earlier, a sense of humility is necessary approaching another culture. Further, the imagination does not exist in a vacuum and is, more times than not, affected by one’s social milieu. Just think of how many metaphors we use today that come from the digital world we live in. As I argued in “The disappearing debate”, however, the solution to appropriation of voice will not be found in prohibitions. The deeper structures of exclusion and marginalisation have to be dismantled. We, those of us who have borne the historical, political and social brunt of white supremacist practices, are often suspicious of the practices that Western, humanist cultures hold sacrosanct, like freedom of speech. We know only too well how these beliefs have been used against us. However, as we watch the pillars of democracy, albeit a very imperfect one, being dismantled south of the border, it sharpens the appreciation of these practices and beliefs. Being against appropriation does not necessarily make one a supporter of censorship: there is a deeper wound that is being identified that perhaps a secular, Western state does not yet have the language to address. Being in support of being able to imagine the lives of others who may be different from you, does not necessarily make you racist. The pros and cons of appropriation are not the issue here, although many found Niedzviecki’s opinions offensive. Indeed, his resignation was demanded because of what he wrote, which he complied with. His arguments reveal an astonishing ignorance and can be easily demolished. I maintain, however, that having an opinion in support of appropriation while offensive to many, is not necessarily racist, just as those who feel it should not happen are not necessarily in favour of censorship. At the risk of being repetitive, I return to the more fundamental one of respect for the literary guests TWUC invited to publish in its magazine, Write. Why, for instance, wasn’t the editorial about the literary history of Indigenous people in Canada, dating back to the poet E. Pauline Johnson and before, so that we, the readers, could have a better idea of where these newer writers fit in? Why did the editor see fit to write an editorial about appropriation to introduce the Indigenous writers invited to submit work, when appropriation was not the theme of the issue? This is not the discussion we should be having as a consequence of TWUC publishing an issue of Write dedicated to Indigenous writers. By linking the issue of appropriation, as he did in his editorial, to the publication of work by invited Indigenous writers, Niedzviecki was being mischievous at best; at worst, unintentional or not, the editorial resulted in racism. Further, using this particular issue of Write as a platform to call for appropriative practices was tantamount to using the published submissions as a form of advertisement for the stories he was encouraging non-Indigenous writers to appropriate. It is an act deeply embedded in an extractive, capitalist culture – one that reduces all activity to use value. The issue of appropriation of voice is not new and there is no excuse for this happening. 25 years ago this was the very issue that split the Women’s Press in Toronto and spawned intense debate across Canada. If there was any real interest in why it was an issue for those writing from formerly colonised cultures back then, we wouldn’t have had the insulting editorial, nor would we have had the vague, confusing apology from the Chair of TWUC regretting “the pain and offence caused…” and talking about Write magazine offering “a space for honest and challenging discussion” and being “sincerely encouraging to all voices” (online here). Expressing regret for “pain and offence” is not a true apology, nor was there anything “honest” or “challenging” about Niedzviecki’s editorial, which has done nothing to encourage Indigenous and other writers of colour to submit work to mainstream publications. Some 25 years ago I proposed that the Union set up a committee to look at racism in writing and publishing, which I was interested in being a part of. I did not receive a response to my letter and my proposal went nowhere. TWUC must be called out on the blatant racism of inviting Indigenous writers to submit to an issue and then disrespecting those writers and their efforts. Anti-racism workshops are not enough. The Union should name the issue clearly – we are writers and words are our medium. It needs to name what happened as racism – the Royal Ontario Museum’s recent apology, some 28 years later, for the anti-black racism of the “Into the Heart of Africa” exhibit (online here) could be a model for the Union’s action. Intention is not relevant, particularly as it relates to the functioning of organizations like TWUC long-steeped in colonial practices. No one may have intended to be racist but the result is a racist one, and TWUC needs to apologise to the invited writers, the Indigenous communities and TWUC membership for this racism. Then it needs to meet with Indigenous writers and figure out where to go from there. 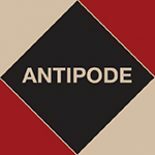 This entry was posted on 12 June 2017 by Antipode Editorial Office in Interventions and tagged Black culture, censorship, colonialism, commodification, cultural appropriation, culture, Hal Niedzviecki, hospitality, indigeneity, Indigenous writers, literature, marginality, politics of exchange, race-baiting, racism, the guest, The Writer’s Union of Canada, TWUC.